Vid Nelson is the birth child of David Nelson, who you may know from the Rumble Gums. On his debut solo project, Nelson shows off guitar chops, a versatile voice and an ear for production. Hints of hip-hop are stewed between tasty guitar solos and big vocal hits. There are lots of groovy corners highlighted on this one—colorful choruses, crazy climaxes, Taste Test Pity City addresses it all. Each song melts together, flowing by as a playful serenade of style and skill that has me asking for earfuls more. 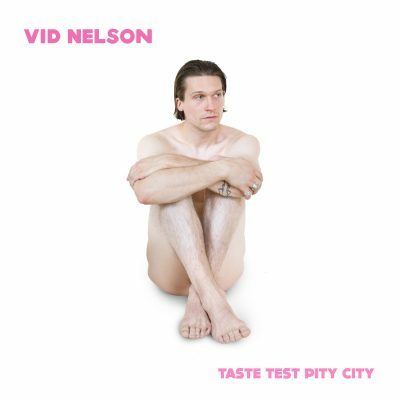 Vid Nelson makes a modern introduction with Taste Test Pity City. It’s a hip mix of synth effects and filtering with a fat pulse. Nothing but spunky and smooth, stringy guitar licks out of Nelson and sassy vocals. There’s certain bliss to songs like “Bottom of my shoe,” which really reminds me of Mac Demarco’s lazy, cheerful style and glues me into the album. Nelson boasts an impressive SoundCloud, where he has been experimenting with his style for a few years. Taste Test Pity City is the well-polished fruit of that labor. I had a lot of fun listening through, and I imagine Nelson had that much fun and more putting it together. Each song is like a playground where he gets to jet mad guitar riffs—and occasionally, a little rap. It all comes together very professionally, with some impressive work behind the scenes with crisp effects. There’s a little bit of every musical genre packed in here, so there’s something for everyone alongside the energetic spirit of the mix.